I had a bowl of mixed beans curry and half a loaf of store bought wheat bread getting pretty hard in the fridge - I cannot leave bread in a cover on the kitchen counter , squirrels enter my kitchen to feast. They even built a House-Tree (as opposed to a tree house) in the AC vent! I then read an article which put the brakes on the potato rich diet I was offering my somalia refugee of a son - Eating greens is necessary to retain one's intestinal health. I then decided to get ride of all my leftovers and get both kids to eat some spinach with a very simple idea - A savoury custard on bread. 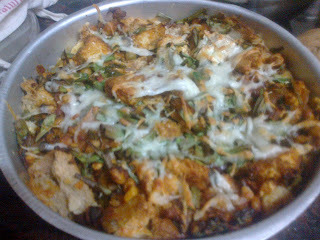 I tore the bread slices, pouired a custardy mix of egg and milk on the eggs, dumped the leftover beans on this mix, added sauteed spinch and onions and baked the whole mix at 175 deg C for 30 minutes. Then I added a layer of grated cheese and baked for 5 more minutes. Voila! Dinner is ready. S. had to douse it in a hot tobascoish sauce, but both kids ate it. Mom's really happy with me right now. I finally took the humongous tiffen box she gave me on a picnic and I even cooked everything that went into it! What you see here are the remnants from the picnic, I had no time to take a picture before we left. We decided to go to Thiruvalangadu and Tiruttani on Sunday ( decided on Saturday, left on Sunday actually). Since we couldn't bear to part from the twins until 11 pm on Sat and then drove home, I got up only at 6.30 on Sunday. So we didnt leave until 9.30 (original plan 8 am). Even that only because Sathish got both the kids up and ready. I made upma kozhakattai for dad's breakfast, cheese sandwich for Gau, jam sandwich for ashu and baked potatoes to fatten gau up. I made awesome thengai saatham with a wonderful twist, tomato rice, curd rice sans fruits, raisins and nuts since ashu prefers it plain. I also fried all the vadam in the house. There is a proverb in Kannada, "Thengu Hingu iddare, manke kooda adige maada bahudu" Iif coconut and hing are available, even a monkey can cook). 50% of this was verified today. I made a coconut-chocolate cake straight out of Chocolate and Zucchini. In my husband's words, it was as good as the carrot cake we used to have at a Cafe. The only changes I made are adding a few chocolate chips and frosting with the leftover Swedish Meringue Buttercream frosting I had from making my younger son's birthday muffins. The occasion was a belated celebration of my dad's birthday (2 day's late but he came home only today). 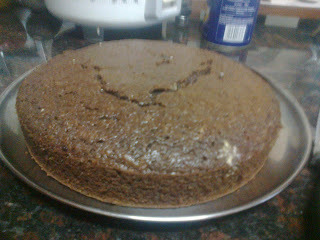 The cake was baked in a 8.5" round pan and took a full 40 minutes to bake as opposed to the recommended 30 min or less. This is the year of doing, not just resolving to do! We had sorted our garbage for months, maybe even years. Our plastics and kitchen wastes were stashed separately, so that the ragpicker could get it without having to go through really gross stuff. But my new baby sitter is really lazy, she will dump all trash in the plastics only bin because it is right there in the balcony, unlike the kitchen waste bin under the sink. She mostly has only fruit peels to dump after feeding ashu. Now I have added a new plastics bin, to the balconey, shiny red and fully covered. I have left my old open plastics bin for her daily use. We have also signed up online for regular sorted trash pickup a new service in Chennai. Now chennai city corporation's uninterested workers cannot negate all the work we put into cleaning and sorting the trash! I will update after 3 regular pick ups.